E-NEWS Sign up- keep track of the Horn of the Month!! This is the same recording of Political Campaign music as Tippecanoe and Tyler, too. This was released originally on Newport Classic and more recently, re-released on Arkiv. The Chestnut Brass Company was a true delight. The concert possessed that elusive balance of technical virtuosity as well as beautiful artistry, fascinating historical information and contexts as well as new music, and the perfect dose of good humor and charm. In addition, the members of CBC were highly professional and personable, engaging with their audience both during and after the concert. Obviously, they love what they do and our audience loved them! "Superb musicianship coupled with a wide ranging repertoire and a wonderful sense of humor, made the evening a happy event, and will long be remembered by those who attended." 5 Stars - A collection of 19th-century American political music You have heard the slogan "Tippecanoe and Tyler Too" and this CD collection of American political music from the 19th-century allows you to hear the song from the 1840 election. Other songs evidence strong feelings both for and against Andrew Jackson, "The Hunters of Kentucky" versus "King Andrew," as well as "John Tyler's Lamentation," "Filmore the Wise," "We Are Coming Father Abraham," and "Hurrah for Hayes and Honest Ways." Even more interesting are the songs about slavery and abolition ("The Grave of the Slave," "Get Off the Track," and "The Fugitive's Song"). Teachers of American history will certainly find tracks to use to supplement their textbooks. There are also instrumental tracks marches, grand marches, quick steps, gallops, a gallopade, a waltz and even a polka for various Presidential candidates. There are also dirges for William Henry Harrison and Abraham Lincoln. "The Platform Committee" singing these works consists of mezzo-soprano Linda Russell, tenors Patrick Romano, Frederick Urrey and Rudolph Palmer, and bass-baritone John Ostendorf. The Chestnut Brass Company plays period instruments, most of which were made during the mid-19th-century, although there are some reproductions. You will hear Keyed Bugles and Cornopeans that date before the Civil War. While most of the instrumental pieces heard in this collection were intended for bands, original orchestrations survive for only three of the pieces ("General Taylor Storming Monterey," "Hail to the Chief" and "The American National Waltz"). The rest of the instrumental works had to be rearranged in the style of the period from piano sheet music. Whether you are an aficionado of 19th-century band music or political history, you will find this a collection well worth hearing. Certainly teachers of American History will be able to use some of the songs to great advantage in the classroom. Note: This album was originally released in 1992 by Newport Classic as "Tippecanoe and Tyler Too: A Collection of American Political Marches, Songs, and Dirges." "They won over the crowd in about a minute and a half...and departed to a standing ovation." "...a high brass standard...faultless playing ability." 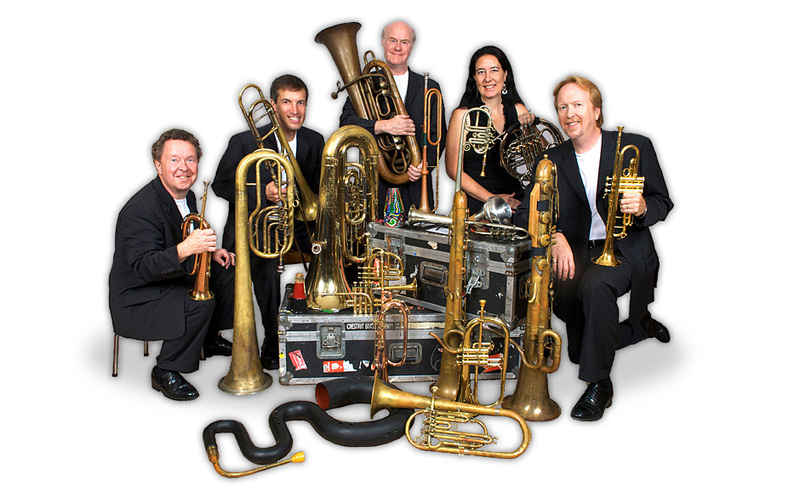 "Talent, skill, superb musicianship and engaging humor - The Chestnut Brass Company has them all."